Our Smudge had the same surgery. We found it more distressing than he did and it was a very short time after that he was able to pick his treats up from the floor. (I cried the first time!) His coat hid the deformity of his shortened jaw and few people realised that the bundle of life had had cancer at all. We had him for many happy years after it. I hope Beamer has the same rapid recovery. Does Beamer need chemo also? My husband asked. My two nieces live in Buckhead. My son just flew there for a wedding. He is at Microsoft Research in Seattle and did a tri flight. One niece is OB GYN and husband head of ER at Grady. WE live in the Palm Beach area. Give him time. If he goes down hill some do accept fate. Pauline’s dog did well. It’s a stressful operation. Again good luck. No, Beamer does not need chemo after this surgery. That was actually one of the determining factors in deciding whether to have surgery or not. We do not want to put the dog and ourselves through that. It’s also not proven to really prolong most dog’s lives. I hope that Sissy is doing well after her surgery. Beamer made it three more years before having another type of cancer show up on jis paw. We had a toe removed and he did well after that as well. Unfortunately, we lost him in December shortly after that, due to bladder stones, so it was totally unrelated. He was a tough boy and almost made it to 15 years of age. Please let me know how Sissy is doing post op. All the best to you and brave Beamer. I cannot imagine how hard this must be for all of you. Thank you, Olwen. Yes, it has been hard, but I hope the worst of all of this has passed now and that Beamer can live out his years happy and healthy. Eggs are also a good option for treats. An well-cooked omelet with some chicken bits and cheese in it would be a good protein option. Just cut it into bite-size pieces and it will be gentle on his front teeth when he takes it. Hoping for a speedy recovery. We just had a massive tumor removed from my son’s dog last week. It was on her belly, she is also 12 and is recovering nicely. I’m sorry to hear about your son’s dog, but glad she’s doing well. There are too many incidents of cancer in our pets these days. :-( Beamer does enjoy eggs and I will often scramble him one with a bit of cheese. Whatever he will eat is what he gets these days. Hi– How big was the tumor? I have a dog with a tumor coming out of his upper gum that is about 1 inch across. Will be seeing surgeon soon. Don’t know if it’s malignant or what will be recommended, but regular vet thinks it may be. So they think your dog may be able to live out a regular life span? Beamer’s tumor was probably close to that size. They first did a biopsy at UGA and then based on the type of tumor it was, recommended the aggressive jaw surgery. Of course, nobody knows what will happen, but if Beamer doesn’t have another tumor, then his life expectancy is about what it was before the tumor. He has a number of other medical issues, so all things considered, he is doing well. Dear Gwen, thank you so much for sharing this story about Beamer! I’m from the Netherlands and am looking for similar stories and tips for our Jack Russell dog, but could not find any in Dutch. A week ago our dog Riffy was diagnosed with the same tumor in his left lower jaw as Beamer and as it was so aggressive he has been operated last Monday. It’s very hard to see how much pain he is experiencing and is missing half a jaw which makes it almost impossible for him to eat. Yesterday he ate like he hadn’t eaten in days or weeks, but today he stopped eating, which makes it also impossible to give him his pain medication. When we try to help him, he starts to panic and runs off. Your story gave us some hope and learned us that Riffy just needs his rest and sleep to get better! And will have to get confident with his new mouth. Thank you again and should you have any other tips regarding feeding him, please let me know. I’m glad that you found my post and I hope the advice I can offer helps with your dog’s recovery. The process of recovery with this surgery was slow. It was as if Beamer had given up and didn’t want to live for a number of weeks following his surgery. I literally had to hand feed him soft foods and his water, oftentimes from the tip of my finger. Beamer still needs encouragement to eat much of the time. It is a challenge for him to eat from a bowl and he scoops his food, but many of the pieces are pushed out of the bowl, so I feed him from a large vegetable bowl with high sides. Since he has become even fussier with what he will eat now, I’ve found that meatloaf made with either ground bison, chicken, or turkey is a good choice. I can sneak in other things that are good for him since he won’t eat most of the homecooked food I have always made him. I add organic whole oats, eggs, cottage cheese, and grated carrots or broccoli, bake it and then slice and freeze the individual pieces so they can be thawed for meals one at a time. I’ve also found a good freeze-dried food that comes in a round biscuit-like shape that I use as a supplement and a snack. that way, when it’s hard to get him to eat, I at least know he’s getting additional nourishment. Hang in there and I promise, it will get better. It takes time and I know it’s a big adjustment for everyone. Please leave me a comment sometime soon with an update. Good luck and hugs from Beamer. Our 7 yr old Aussie, Neyo had this surgery today. He was supposed to have a less invasive procedure to remove teeth and scrape the bone and the tumor was much worse. He ( and we) are pretty shocked and scared. He’s home. On drugs but in pain. I’m happy to hear of your dogs recovery and will happily hand feed him. I’m nervous about the next week. I wish you the best of luck with Neyo’s recovery. It’s a long process, but it does get better every day. I promise. Our Dog Toby has a tumor on his lower jaw. We have been advised that he neefs his left side lower jaw removed. He is a irish kerry blue , my husband thinks its unfair to toby to have this operation .we just dont know what to do? We did this surgery three and a half weeks ago for my lover dog and are starting radiation tomorrow. I wish I would have offered this consolation before, but here it ts late. We live in Columbus, Ohio. We are blessed with one of this country’s premier veterinary hospitals at Ohio State and by MedVet. Experts at both said we could do nothing else than do this surgery. You have done the right thing. Sloppy eating and wild drinking you are used to by now. But today, on a lovely, rainy afternoon, I got to doze quietly with my best friend. Actually thanked my surgeon for the gift today. Thank you for leaving a message and I hope Misty continues to improve. It’s amazing how resilient these dogs are! Beamer is able to eat his hard chew treats and biscuits. We waited about 10 or 12 weeks before trying them, but he manages to chew them in the back of his mouth. He loves them and it’s good for his teeth. There are some soft chew treats from Buddy Biscuits and a few other brands that are natural, so look for those, in. You may have to order them online. In the meantime, the pumpkin ones will be perfect. I even broke those up into tiny pieces at first since he couldn’t chew at all. It is hard for Beamer to grab things when they fall on the floor, especially on the hardwood floor. 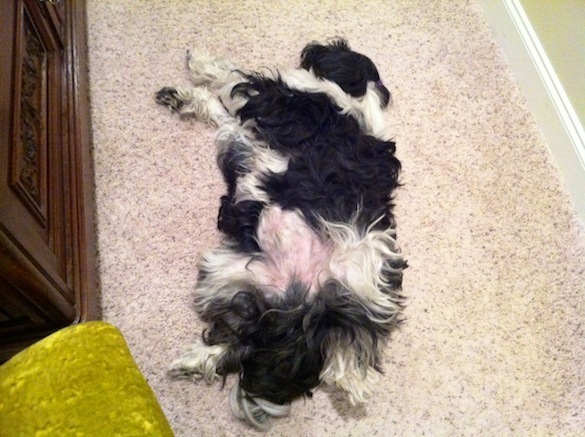 Carpet is easier. Since I cook his food, he gets a soft diet anyway, so it wasn’t a big transition. There are things he will no longer eat, but I think that’s by choice and unfortunately, rice is too small to scoop up, so I can’t give him that for an upset tummy. One thing I still do is make bison, chicken, or turkey meatloaf and load it up with eggs, organic oatmeal, grated carrots and broccoli, and cottage cheese, so I can sneak good stuff in. Let me know how Misty does down the road and good luck! I hope Beamer is still doing well. My wife and I were recently thrust into a similar situation with our almost 9 year old German Shepherd Max. She felt a lump on his jaw on February 1st and was at the vet’s office with him the next day. As with Beamer, we got a referral to UGAs Veterinary Teaching Hospital. After 2 days of testing we’re both numb with the feeling of impending loss. Max is back home with us now. My wife has always cooked for him so he’s eating a little and drinking some water so we’re hopeful that we’ll have more time with him. I can’t see him going through the surgery though. We will keep him comfortable and enjoy every minute we have with him until such a time come when we can’t stand it any longer. Yes, Beamer is still doing well and hanging in there. He’s slowed down, but he’s also past 13 years (December was his birthday). He has actually been quite perky with the cold weather and eating nonstop! I would highly recommend the surgery if cost is not an option and the surgery is. Beamer recovered well from it and apparently, most dogs do. It’s better than watching them suffer while the tumor grows and we were told, it also is very painful when it grows into the bone. Dogs are resilient and Beamer has proven that again and again. Good luck with your decision and I wish the best for Max. Hi, Please let Beamer know that his experience has been inspriational to others. My little girl Savanah, 10 year old Boxer, was diagnosed as having a jaw eating tumor. When I noticed the red bump under her lower canine the first vet said she needs to have a teeth cleaning. I knew something else was wrong since she was a pawing at it and trying to rub her face all the time plus I get Savanah’s teeth cleaned every 3 years. After consulting with a different vet a biopsy was done and the conclusion was either she would need to have 1/3 of her lower jaw removed to stop the bone from being destroyed or to do nothing that would eventual cause her more pain and eventually she would stop eating. I wanted to make sure I did the right thing that would cease any pain and still allow her to be functional. I had never heard about jaw removals on dogs so that went google was my best friend. I read stories and thought about the options day and night. Having an older dog comes with a lot more complications under surgery so I decided I would go to one of the best places in Florida. I drove 5 hours to Unviersity of Florida small animal hospital. I wanted to go to the place that trained the surgeons and that had the most advanced equipment. When we got there I knew I made the right choice, the place was great and Dr. Vincent, oncology surgeon, could not be any more patient and informative and yes I am a control freak when it comes to my little girl and well almost anything in life. Savanh had the surgery 5 days ago. They treated her and me with some kindness, even sending me pictures of her the night she had to stay over. They said she ate within hours after surgery and the next moring the same thing. I picked her up on Wed and we made the 5 hour drive home. When I got home I think I had more of an issue with her inability to eat and how helpless she looked. My heart broke every time I looked at her and still does. I thought ….how cruel of me and what did I do to her…second guessing my decision. The first time I had to feed her was so hard, I tried to have her eat her soft food by herself but she couldn’t since she used to scoop her food now she would have to learn how to eat all over again. I fed her by hand for the first 3 days but yesterday I made sweet potato mashed with water’d rice and canned dog food. I made a nice little pile on a plate and she ate it, yes it was very messey but she tried. Savanah did look at me like what did you do and why did you do this to me. I even told my friends that she is mad at me and I know she could pick up on my difficulty in dealing with her post surgical look and helplessness. She is coping at the same time I am coping. She did stop drinking water and I was concerned so I put a little cashew milk in water and she drank it. I like your meatloaf idea and I think I will do the same plus pumpkin cookies will be a good snack. I think it is important for others to read the stories to know what to expect. Even though it WILL STILL be a shock when they see the baby for the first time but they will know they are not alone. Beamer says hello and sends his wishes for a full and speedy recovery! 🙂 I can promise you that with time you all will almost forget this happened. Beamer has adjusted really well to the way he now has to eat and is a proud member of the clean bowl club for almost every meal. He still loves his meatloaf, chicken and rice or veggie pasta, and scrambled eggs. He’s not a lover of veggies when I cook them, but will eat them when they’re in his chicken, turkey, or bison meatloaf. He also really loves his snacks and the hard ones are great to hep clean his teeth since he can’t chew quite like he did before. While it’s a tough decision and really rough for awhile, it is the right decision if your dog is otherwise healthy. We’re so happy we did it, although it was very hard to see him like that right after the surgery. Hus surgery was in the fall of 2013 and he’s still here with us. I know that would not have been the case had we not done it. Each day gets better, so I know things will improve. Good luck to you both! I just wanted to say thank you for posting your story. Our dog just had this surgery yesterday and we still haven’t gotten him home or gotten to see him. Reading your story really helped my husband and I feel some sort of comfort in this crazy situation. I just wanted you to know that you’ve helped a lot of people cope with a very difficult decision. Thank you for your kind words. I hope all goes well with your pup. It’s hard, but it does get easier. We’re thankful every day for the additional time we’ve had with Beamer. It would not have been possible without the surgery, even though it wasn’t easy. Please send me a message and let me know how things go once your dog is home and settled. A follow up to Savanah …4 months post surgery. She is doing so good it is amazing. She is still a messy eater…but nothing stops her from eating. Her bottom jaw droops a little but she is still as cute as ever. Beamer’s storry helped me and I would be happy to help others. I’m so happy to hear that Savannah is doing well. We’re also glad to know how much Beamer’s blog has helped others going through the same surgery. We wish you the best going forward! It’s so nice to hear that Mystie the Sheltie is doing so well at almost a year after the surgery. Beamer has some challenges with eating, too. I feed him in a large deep bowl so that he has plenty of room to scoop up his food. He has no trouble eating hard chew treats, but does struggle with regular meals a bit. Beamer is 13 1/2 years old so we also have some typical old-age issues combined with the compromised immune situation from the surgery and his earlier paralysis, but he is an amazing boy. We enjoy every day we have with him. If you’d like to see recent photos of Beamer, you can see some on my Instragram account https://instagram.com/bunkycooks/ or on Facebook https://www.facebook.com/Bunkycooks. I hope all continues to go well for you and Mystie! We would definitely do it again. Beamer recovered well and it still with us three years later and he’ll be 15 years old next month. The cost at UGA was about $1200. Dogs adjust better than we do in most cases, so if you can do the surgery, your pup probably has a lot of life left, as long as it’s nowhere else. If you’re near a veterinary teaching hospital (like UGA), the cost will probably be less than a specialty vet clinic. Yes, LSU vet school would do it. I forgot to mention that most of the type of tumor he has are benign, but his is malignant. My vet is working on getting me a consult there. I was thinking the surgery would cost much more. 1200 isn’t bad (assuming under 1800). I would consider it for that price. But like I said, it was far back in his mouth and while the vet thought she got wide enough margins to be on the safe side, the margins weren’t clear. His path report says his prognosis is “guarded”. Because of the location, I’m not sure they can remove it all, but that would be what the consult is for. Thanks so much for responding. Our dog is going through this surgery on Tuesday. It will be pretty extensive from what we’re told, so of course I’m going online (always a bad idea) for any details and photos. I appreciate your day-by-day account, because I genuinely want to know what to expect (vs. the dr’s he’ll be good after 1-2 weeks, etc). And we too are struggling with whether or not it is the right decision. We just want him to be happy. Waaaaaaaah! Thanks again for your post! I’m glad this was of help to you. It is a hard decision, but Beamer did well after he adjusted to his new normal. I would say it was more like 8 or 10 weeks before he was able to chew hard treats again. One to two weeks is pretty early in the process as it is a major surgery. Beamer did not have anything else show up for three years and then he had a different type of cancer on one of his toes, which we had to remove. We haven’t had the heart to update this blog, but, we sadly lost him December 5 to something totally unrelated – he had bladder stones and blockages in his urinary tract. We lost him very quickly and unexpectedly from something bizarre. He almost made it to his 15th birthday. I’m sure your pup will do fine with this surgery. Just be patient, love him, and help him with staying hydrated and eating soft foods. They do seem to adjust really well over time following this surgery and can live very normal and healthy lives post op. Wow, 15! That is great. So sorry to hear, though. Our English lab just turned 11, so although we know he is up there in years, we still feel like, if he did have a voice, that he would want to live at this point (that’s how my husband gauges our decision – what would Sam want?) Good to know about the 8-10 weeks. We are going out of town at the 3rd week and will have a gal here watching him, who is well aware of what is going on, but it will be good to give her an extra heads up. We haven’t told our 5 and 8-year-old yet that he will look differently (the surgeon also mention atrophy in his skull as a result!?!!) , as they are already so sad about the surgery, but we will prep them before he comes home. Thank you again for the details, they are very helpful! Update: we lost our boy in mid April 😦 we are sorry to hear you lost your Beamer too. I would be more than happy to tell you about my Savanah’s story. She was a boxer and also 10 years old when diagnosed with a jaw tumor on her lower jaw. I drove about 5 hours and had the surgery at University of Florida Animal hospital. This is the best place I found for excellence in handling this type of cancer. The decision was tough but I didn’t want to give up on her since she was still very active. After the surgery I was sad for her however after a short time she was back to her normal self. She didn’t look the same but she was still as cute as ever. I had to feed her differently but since she loved to eat it wasn’t an issue. Every case is different but I would do it again if my newly adopted boxer had the same issue. Savanah lived a good life for 2.5 more years. She died at 12.5 yrs old on Oct 27 2016 and I adopted my new girl one year later..to the date. If you need more information or need to talk, please feel to reach out to me and I will give you more details. Beamer’s corner helped me get thru the after surgery process. His story was an inspiration to me and helped me get thru the early post surgery days. I’m so glad we were able to help others with this blog and as you, we are happy we made the decision to have this surgery and keep Beamer in our lives for several more years. We need to update the site and finish his story, but I haven’t had the heart to do it. 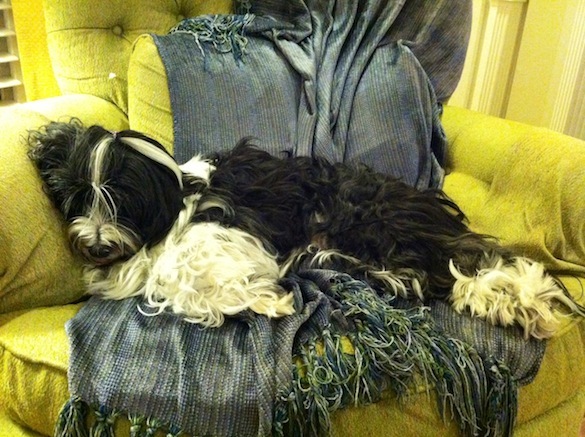 We hope to get another Tibetan Terrier later this year. The new dog will not be able to replace our sweet boy (and we don’t expect them to), but we look forward to loving another TT and having that special companionship. We didn’t do the consult at LSU where they had offered radiation as an option (through correspondence with my vet). I wouldn’t have been able to handle the back and forth plus the extra care needed. My boy pulled a muscle in his leg bad in early April and it wasn’t healing. He declined pretty quickly from the start of April. The vet was very comfortable with our decision to put hom down when we did. I do not and have not regretted our decision. We lost our rescue 15 year old hound boy that December, my boxer/bully boy to cancer that April and our old man rescue bulldog in June. It was a rough 6 months. We now have two English Bulldogs who are two years old, the boy adopted in July as a re home. I miss our motley crew, but as I said, I feel one hundred percent content with our decision and I do not regret it. I know this is an old post and see that you have now sadly lost Beamer but wanted to let you know that his story is still helping people and doggies. My dog, Tilly, is 13 and because of an aggressive squamous cell carcinoma she underwent the surgery on Wednesday. We get to bring her home today and she is not eating at the vet but because of your post I am ready and prepared for the next few days/weeks/months and have a plan. I know it is going to be rough but we are hopeful she will have a few more years and cannot thank you enough. I had actually found this post a couple of weeks ago when we were first confronted with this and couldn’t find it again at first last night when I was getting everything ready for her to come home but I am so glad I finally did! I don’t know if this page is still open but if it is I can use help. I could not read all of these posts to see if my questions would have been answered because of crying. My daughter’s service dog is four years old and he has been diagnosed with Squama Cell Carcinoma. We are taking him to a hospital in Gainsville, Florida for a second opinion. They are talking about his jaw being removed but we are not sure of how much yet. Can the dogs pick up things at all? This is one of the things he does for her. Will the quality of life be good? He loves a favorite toy a ball will he be able to hold this? Do you have to be careful of infections? I know the doctor will answer these but would like to hear from people who have been through it. Yes, Beamer did really well and resumed a mostly normal life after about 8-10 weeks. I had to help him eat soft foods initially and you may need to change your dog’s diet a bit, but they do really well after recovering from this surgery. It allowed Beamer to live over 3 more years and he had a wonderful ife. As for infections, we did not have a problem. They will, of course, give antibiotics post op. I did not see this until our Maui had his surgery. He had his surgery on December 14th. We had to leave him there because he had a very swollen tongue. He also had to have a feeding tube and is throwing up. We are just beside ourselves that we had to leave him because we live five hours away. We are going back tomorrow in hopes of bringing him home. Good to know about his recovery. You left a comment on another post, so I hope you see this. I’m sorry to hear about your sweet girl. It will take some time for her to recover, so be patient. The time when they feed themselves is quite a bit out and by 8 or 10 weeks Beamer could chew a hard snack. I fed him by hand quite often, even after the recovery period. I think they always have a weird feeling scooping food and you need to get a large and deep bowl (like a vegetable serving bowl) that allows them the room to scoop their food. They don’t have the same motion allowing them to eat after this surgery. You asked about the pumpkin cookies. The recipe is on this site. Here’s the link https://wordpress.com/view/beamerscorner.wordpress.com. For the meatloaf, I mixed either ground turkey or bison (2 pounds or either) with several beaten eggs, about 1 cup of cottage cheese, 1/2 – 1 cups organic rolled oats and mixed that with 1 or more cups of grated veggies (broccoli and carrots). It was never the same recipe twice. I baked it at 350 or 375 until it was 160 degrees for turkey or bison and then let it rest. I sliced it and put it in the freezer in individual bags. I suggest using the ground bison right now. We are convinced bison aided in Beamer’s recovery since the meat is so much better than beef and aids in recovery with all the protein, nutrients, etc. Good luck and I hope everything improve soon. I hope Maui is doing well. Keep me posted on his recovery. Maui came home yesterday. He had to stay 3 extra days due to an issue with his tongue. He came home with a feeding tube for now. He seems to be very happy being back home. The other dogs we have are leaving him alone. He keeps going to the water bowl don’t think he can figure out what is going on. Thank you for your post, so happy Beamer adjusted well after surgery. I am going through this with my 14 yr old lab Sadie. But I chose not to do surgery. Her tumor is growing and is uncomfortable for her. Not sure if I made right decision though in not doing surgery. How is Sadie doing? I am thinking about declining surgery as well for my Boxer boy. I am trying to do as much research and get feedback on what I should/shouldn’t do but it is hard. I feel like by boy is almost 10 and has had a really great life and is still full of energy, he is pretty goofy. Thinks he can run a marathon but then 10 minutes into his run he is like ok lets go to bed Momma! He has a huge mass on his lower jaw, on the canine tooth actually. it was removed by his vet in November 2017 but it came right back (we kind of knew it would) The surgeon looked at the cancer last week and basically spoke of removing the jaw to prolong his life and I just don’t know if I can go through with it. It feels selfish to buy time and not allow him the quality of life he has now but I am sure he will start to have pain. I know the other day he hit his jaw on my knee and he yelped like I never heard before. I am very confused on making the right decision for him and not me and my Son. This blog was very helpful – our dog had the surgery about 2.5 weeks ago and we are still doing hand feeding – though showing some signs of being able to get small bits of food up from plate – will try the large bowl. He does seem happy and active. We are wondering about what type of toy to give him since he so loved to chew on his hard rubber toy. He had half of his bottom jaw removed due to a malignant tumor. He is our 93 year old father’s companion. I’m glad you found this information helpful and that your pup is doing well. 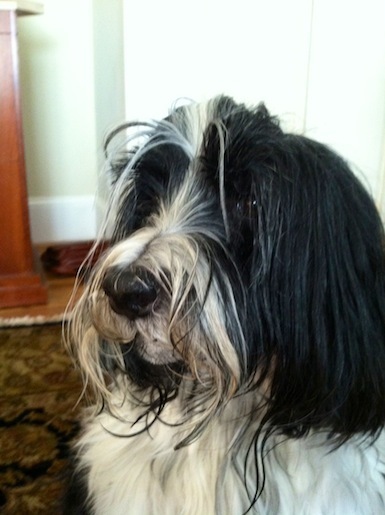 Our breeder (we now have another Tibetan Terrier as of July this year) says she believes there is a relationship between plastic and rubber toys and mouth cancer in dogs. She’s seen it many times and has advised us not to give our new boy any of those to play with. He does enjoy rope tug toys and I would try basic soft squeaky toys for your dog. I hope those work. Tried the large bowl and it worked! I am new to the comments. Thank you for sharing your experiences, both positive and frightening. Today we had our first consult with a dental surgeon for our 11 1/2 year old female Rottweiler mix Lacy. We had found a small lump under her chin and had it quickly checked out. Our vet did xrays and a needle biopsy. She quickly set us up for the consult because she found tumor cells and she recognized the urgency from experience. Today the results were not what we had hoped for. The dental vet said she was not sure what cancer it was (but it looked very aggressive and had spread to the very back of her jaw) and the only way to find out was to have her surgically biopsy and remove some bone, send it off and wait. Once the tumor was identified we could have the entire lower left jaw removed at another appointment. The second choice was to remove the entire jaw TODAY and hope for a good recovery and an undetermineable quality and length of life. It was emotionally impossible for us to decide today so we are on the schedule for Tuesday, March, 19, 2019. I have read all the above posts, consulted with other dog world people and googled until I’m exhausted. Our Lacy is in otherwise excellent health and since we adopted her exactly 10 years ago has had a queen’s life so it weighs heavy on us to risk surgery and her mental/physical quality for what could result in precious little extra time. While I have had extensive dog experience I’m not sure how I could handle the recovery period. We had lost two male Rotts to osteosarcoma 11 years ago but neither had any surgery as they showed no signs until it was too late. I have nursed knee replacements but not something as critical as this. At this moment, and my mind changes frequently, I think we will continue to baby her and manage the pain when it comes. I would greatly appreciate some feedback from anyone that chose not to pursue surgery but basically, hospice care. I want to know what indications, if any, their loved friend showed and how they were cared for and sadly any kind of timeline. Please, if you feel this isn’t a thread for this conversation, please let me know if there is another that may help me. I am so happy that Beamer and others had success and I am truly sad for those that didn’t or have left for other reasons. Again, thank you for sharing and caring. I’m very sorry to hear your situation and I hope someone can respond to your questions. We felt it necessary to go ahead with the surgery since Beamer was in such good health. We had over three very happy and loving years with him post-op, so it was worth it to all of us. This type of cancer is aggressive and painful growing into the bone so we could not do that to him and watch him suffer. Most dogs don’t even express pain (Beamer didn’t), so I think it would be hard to know how much is too much for them. This is our opinion and while it was tough for weeks after the surgery, I know we made the right decision for our family and for Beamer. If you do decide to have the surgery, we had a general surgeon at the veterinary hospital do it. I’m not familiar with a dental surgeon performing the operation so I would look at your options to be sure.